It requires very little attention, looks terrific with bright red fruit laden branches. Mine is now about 20ft tall and wide spreading. 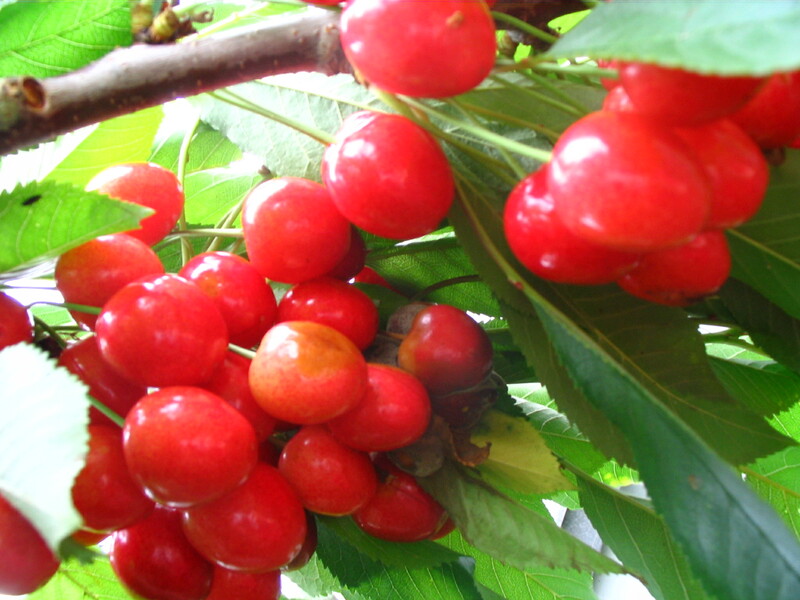 It bears tons of cherries - too many for me to pick so round up a few friends to help. It is at its best about a week before Christmas. I hardly watered it in the drought and it still survived and fruited well. I would like to identify the type of cherry. I was told that it was a Lapin but not sure. It is self pollinating. Although the cherries look terrific on tree they are sour so am wondering whether it is a sour cherry. However if left to fully ripen on tree it becomes darker and sweet but still remains a mahogany colour - not dark like a Stella. Does anyone recognise it? I pruned it 2 yrs ago after it fruited and it produced less cherries, but bigger ones and the birds all got them so they must have been sweet as the birds are leaving them alone this year. They do not split, but I have brown rot in them now because of this unseasonal rainy weather we are having. As I live in Castlemaine, Vic it is a cold climate and therefore very suitable for cherries with -5 o/n temps.